The Black Display Case Arrangement allows you to purchase all of the essential pieces together to create a custom built-in unit that will give you years of affordable elegance and dependability for your retail store. The Display Case Arrangement includes one of each of the following: 70"L Full Vision Display, Open Shelf Corner Filler, Well-Top Register Stand, and 48"L Service Counter. Our case offers a number of features for your money that you will be happy that you took advantage of. 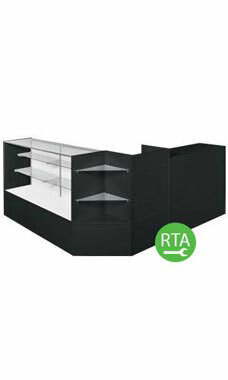 Our display cases feature a low pressure melamine laminate finish with tempered glass top, front and sides. Additional features include easy sliding rear hardboard doors, and anodized aluminum frame extrusions.